The Dark Net (2017. 253 pages) is a supernatural thriller, written by American writer, Benjamin Percy, who has previously written The Dead Lands, Red Moon and The Wilding, as well as publishing two books of short stories. The book is an easy read, I noted how uncluttered it felt. The narrative is fairly linear to the point of stretching credibility as the characters are either known to another character or related to them. This made for a straight forward structure, where only the minimum back story and character motivation is needed to keep the whole train on the tracks. Amongst his other works and accolades I discovered that Percy also wrote for DC Comics for the Teen Titans and Green Arrow books. It is also the sort of storytelling which is popular in film and television and I could quite easily see this being successfully turned into either of these mediums. It’s not really a spoiler to say that in Portland Oregon, demons are using the dark net to infiltrate the human world, to open a portal for them to come through and do what demons do, as its written all over the back of the book. It’s an interesting idea and could quite easily have been buried under the morass of technical knowledge that the reader had to take on. Thankfully Percy’s explanations are precise and coherent so you never feel like you have just been pulled out of the plot for an info dump. 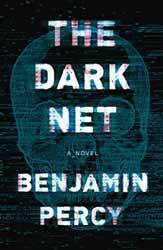 The book has little of depth to say about the use of such technologies like the dark net, as it is used as a McGuffin to glue the plot together, the question being will Hanna and her band of weird misfits be able to save the day or will all hell break out of our technology. It seems that the answer was a little of both. It’s not a particularly long novel and if you don’t mind skirting over some of its limitations it’s an entertaining, but disposable ride.